–Osama bin Laden, terrorist mastermind and, as it turned out, prophet. One of the many signature accomplishments of the Obama administration was inviting Russia to take a role in the war in Syria. If one were writing a John le Carre-style novel one could draw a straight line from our withdrawal from Iraq to the rise of ISIS to the Arab Spring to our attempt to overthrow Assad to the rise of ISIS to the increase of Iranian power to using the Russians as our intermediary with Iran to negotiate the now-defunct Iran nuclear deal to a Russian military presence in Syria. But as Iran’s power has grown in the region and it looks more and more intent upon creating a Shia empire stretching from Tehran to the Mediterranean, it has become an existential threat to Israel. Israel has struck at Iranian bases in Syria and the intermixing of Russian and Iranian assets has now become a liability. Two days ago, Israel told Russia that it would no longer confine its attacks to Iranian targets along the Syria-Israel frontier but would now target them throughout Syria. Israel has told Russia that it will broaden its military operations against Iranian positions in Syria to include the entire country, an international Arabic newspaper reported over the weekend. According to London-based Asharq al-Awsat, Israel has decided to expand its “red lines” in Syria and will no longer confine itself to the area near its southern border. Israel has been cited as the source of numerous air and missile strikes in the country on sites connected to Iran and its Lebanese terror proxy Hezbollah. 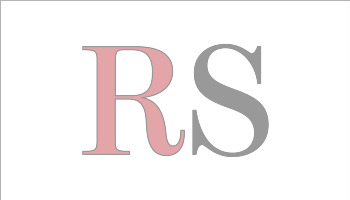 Now Russia is trying to extract its Iranian client/master (because the Russo-Iranian relationship has Russia both leading and being the toady to the Iranians) from a no-win predicament. Iran can’t stay in southern Syria because they can’t project the force necessary to either deter Israeli attacks or to defend their own forces. They can’t leave, because to be seen as being booted out by the Jews would destroy the aura of invincibility and inevitability that Iran has tried to develop around its march to the sea. Israeli political and military leaders believe Russia is willing to discuss a significant distancing of Iranian forces and allied Shi’ite militias from the Israel-Syria border, Israeli officials say. The change in Russia’s position has become clearer since Israel’s May 10 military clash with Iran in Syria and amid Moscow’s concerns that further Israeli moves would threaten the stability of Syrian President Bashar Assad’s regime. Russia recently renewed efforts to try to get the United States involved in agreements that would stabilize Syria. The Russians might be willing to remove the Iranians from the Israeli border, though not necessarily remove the forces linked to them from the whole country. Russia, too, is dealing with a public relations problem. It is trying to link a withdrawal of Iranian forces from the Syrian border with a withdrawal of US forces around al-Tanf–this was the location where Russian mercenaries got the snot beat out of them by US forces back in February. Without some sort of face-saving deal, Russian prestige will suffer and the Iranians will start thinking the Russians are looking for an exit. And they are. What had started out as a venture to procure a Mediterranean port and supporting logistics facilities and airbases to project Russian naval power into the Eastern Med has become an oozing ulcer, costing Russia cash and lives. None of this just happened.Leon Hadar has an interesting article in The National Interest called Trump’s Strategy for the Middle East Is Working. In it he juxtaposes the way Middle East crises used to work and the deft change of calculus made by Trump (I’m using Trump as a metaphor for his administration because guys like Mattis and Bolton and Pompeo have watched the Middle East for a while). Remember the days when any sign of growing tensions in the Middle East, not to mention a new act of violence involving Arabs and Israelis, would have immediately triggered pressure on Washington to “do something” as soon as possible. Doing nothing, U.S. officials were warned, could risk a full-blown regional war, outside intervention by global adversaries, oil embargoes, the collapse of pro-American Arab regimes, the survival of Israel, and perhaps even the end of the world as we know it. This kind of American diplomatic hyperactivity in the Middle East would be followed by the deployment of U.S. peacekeeping troops and the provision of huge financial assistance packages, with the Americans being drawn into never-ending efforts to resolve unresolvable conflicts, continuing to raise the costs of U.S. intervention in the Middle East. And you could always count on America’s European allies, in another demonstration of their free-riding on American power, to press the United States to “do something” and then criticize Washington’s policies as a way of pandering to the Middle Easterners (“See, we aren’t as pro-Israeli as the Americans”). Although President Trump has yet to state a coherent foreign-policy doctrine (something that he shares with his predecessor), it seems that his idea of U.S. disengagement from the region has been to support Saudi Arabia and the other Arab-Sunni states and Israel to encourage them to use their military power to contain what they considered to be an Iranian threat to their security. At the same time, he supported allowing the Russians to establish some sort of stability in Syria, and make it possible for the United States to end its military presence in the Levant now that the Islamic State has been defeated. It is interesting to note that many officials and pundits in Washington continue to operate under the belief that what happens or would happen in the Middle East, including the prospects for a military confrontation between Iran and Israel, depends on what the United States says and does. In fact, both sides are being driven by other considerations (Iran’s interest in exerting its influence in the region; Israel’s concerns over Iranian military presence across its border with Syria), and nothing that Washington would do is going to change their respective strategic calculations, short of deploying U.S. troops to Syria. But this time around, the global actor that needs to be worried about the possibility of a military confrontation between Iran and Israel in Syria is Russia that recognizes that that could threaten its evolving Pax Russiana in the Levant. President Putin would, therefore, need to use Russia’s military and diplomatic power, including his close personal ties with the Israeli and Iranian leader, to prevent that from happening. 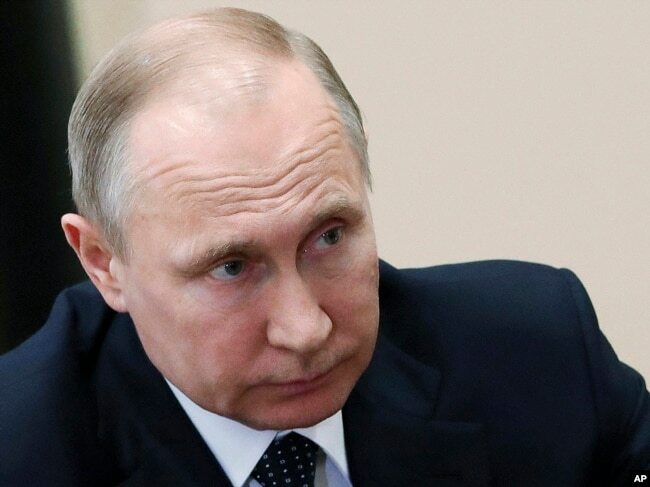 As the Americans learned in the past, that kind of diplomacy ends up being the target of criticism by all the major players, as Putin discovers that he has no choice but to bribe the Iranians and the Israelis, without receiving any gratitude from either side. If Putin succeeds in his efforts, and convinces the Iranians and the Israelis to adhere to a set of rules of engagement in Syria. he would win a few diplomatic brownie points for averting an Iran-Israel war. If he fails, Russia and not the United States would be blamed the ensuing mess this time, allowing the Trump Administration to pick up the pieces, if it so desires. But isn’t the withdrawal of the United States from the Joint Comprehensive Plan of Action (JCPOA), and the tough posture the Trump Administration has embraced in dealing with the Islamic Republic, run contrary to President Trump’s goal of reducing U.S. military presence in the Middle East since it supposedly would lead to a confrontation between the United States and Iran? I think Hadar misses a larger point here. This forcing of the Arab states and Israel into an alliance, and this was a stated objective of Trump in his visit to Saudi Arabia–a visit that was overshadowed in some quarters by his participation in a sword dance and Toby Keith performing to an all-male audience–has defanged the Palestinians. They are seeing that no one really cares about them and while the Arab states are willing to say pleasing things, the Palestinian issue is a secondary concern to states fighting for their very lives against Iran. This is a generational, if not permanent, re-ordering of the Middle East. At the same time, while much of the conventional wisdom has been that the opposition to revoking the by America’s European allies is driven by their business interests in Iran, the fact is that they, and in particular France and the other southern European countries, are even more concerned about the more direct threat that a nuclear Iran and its ballistic missiles could pose to their security. That explains why France was insisting on tougher restrictions on Iran during the negotiations over the JCPOA, and why French President Emanuel Macron is interested in working on some sort of a compromise that would prevent the Iranians from restarting their nuclear military program. He is fully aware that only the United States could guarantee such a deal. And, amazingly, this is serving to reduce Germany’s ability to call the shots for the EU on how it relates to Iran. In sixteen months the Trump administration has beaten ISIS to rags, forced Israel and Saudi Arabia into a virtual alliance, and has the Russians looking for the exit. This is not a bad start. FILE – State Department spokeswoman Heather Nauert speaks during a briefing at the State Department in Washington, Aug. 9, 2017. The U.S. State Department says Russia has tried to block an international watchdog from investigating a suspected chemical attack in Syria “by making it more complicated” for the specialists to do their work. “They probably want to do that because they recognize that the longer that a site goes untested the more that the elements, the chemicals, can start to disappear,” State Department spokeswoman Heather Nauert told Alhurra television. The investigators from the Organization for the Prohibition of Chemical Weapons arrived in Syria on Saturday, but so far have not been able to begin their work in Douma. A Russian official says the OPCW team is set to visit the area east of Syria’s capital on Wednesday. Russia has blamed the delays on airstrikes carried out Saturday by the United States, France and Britain on three Syrian chemical weapons facilities. Russia’s Deputy Foreign Minister Sergei Ryabkov also said the mission was not allowed in because it lacked approval from the United Nation’s Department for Safety and Security. Russian President Vladimir Putin listens during a meeting in Moscow, Russia, Friday, April 13, 2018. U.N. officials in New York disputed the claim. He added that U.N. Secretary-General António Guterres is very supportive of the investigation. “The secretary-general wants to see the fact-finding mission have access to all the sites it needs to have access to, so that we can have the most thorough and full picture of the facts,” Dujarric said. The U.S. envoy to the OPCW, Ken Ward, said Monday it was his understanding Russia had already visited the site and he raised concerns of tampering before the OPCW carries out its fact-finding mission. 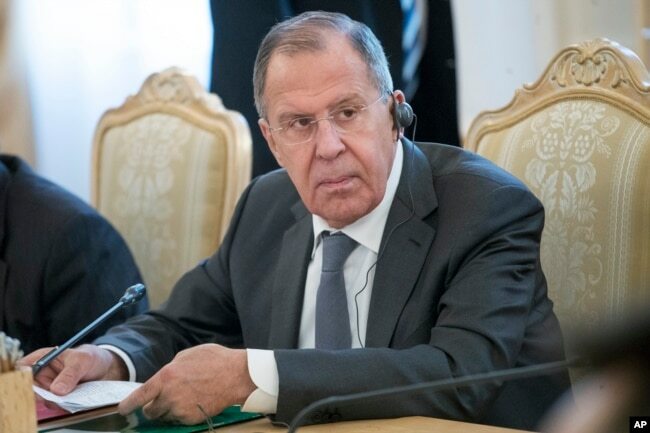 Russian Foreign Minister Sergey Lavrov attends a meeting in Moscow, Russia, April 5, 2018. Lavrov said that evidence cited by the United States, Britain and France to justify Saturday’s missile attack was based “on media reports and social media.” He denied any chemical weapons attack had occurred, accusing Britain of staging the attack. The Group of Seven leading industrialized nations issued a joint statement Tuesday endorsing the airstrikes. “We fully support efforts made by the United States, the U.K. and France to decrease the capacity to use chemical weapons by the Assad regime and to prevent their future use,” the leaders of Canada, France, Germany, Italy, Japan, Britain, the United States and European Union said. Syrian media reported another missile attack early Thursday in Homs province, but later said it was a false alarm and not an outside attack that triggered air defense systems. Syrian media reported another missile attack early Thursday in Homs province, saying government air defenses shot down most of the missiles fired at an air base. The reports did not say who was responsible, and the U.S. military said neither it nor the coalition it leads was operating in that area at the time. 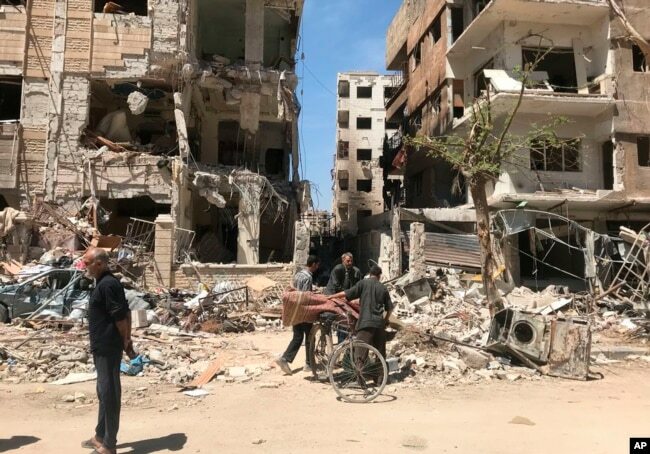 People stand in front of damaged buildings, in the town of Douma, the site of a suspected chemical weapons attack, near Damascus, Syria, April 16, 2018. 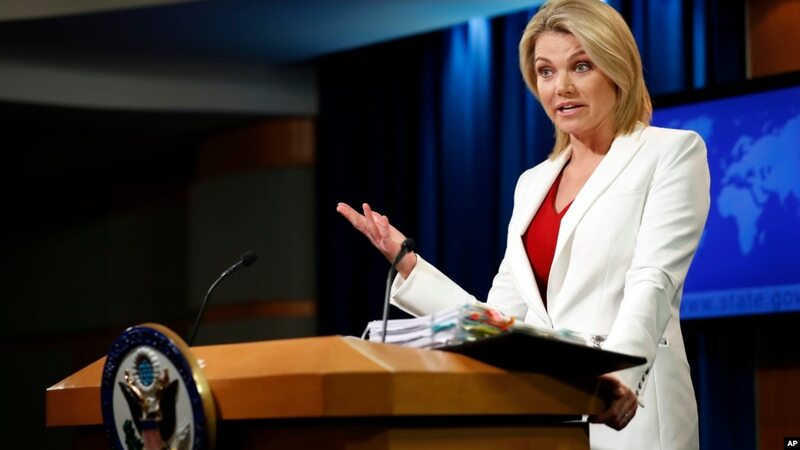 Nauert told Alhurra the United States is pushing for a renewed focus on the so-called Geneva process the United Nations began in 2012 as a roadmap for ending the Syrian conflict with a new constitution and elections. EU foreign policy chief Federica Mogherini made a similar call Monday ahead of a ministerial meeting, saying there is a clear need to push for re-launching the U.N.-led peace process. Russian forces did not interfere when 72 Turkish jets Saturday night pounded 100 Kurdish YPG targets in the north Syrian enclave of Afrin. Early Sunday, Jan. 21, Kurdish and Syrian opposition sources confirmed that Turkish troops trying to enter Afrin clashed with the Kurdish militia on the northern and western edges of the enclave and were pushed back. Turkish president Tayyip Erdogan continued to issue dire threats, saying, “Beginning from the west, step by step, we will annihilate the terror corridor up to the Iraqi border. No one can say a word. Whatever happens we don’t care anymore. ”The Turks have cynically dubbed their assault on the Kurds, “Operation Olive Branch.” Kurdish leaders are reported to have opened secret negotiations with the Assad regime for opening the door to the Syrian army to enter their enclave on the assumption that Erdogan will not wish to open a new warfront with Damascus. Turkey’s deputy prime minister Bekir Bozdaq said that Ankara would preserve Syria’s territorial integrity after it achieved its objective and Turkish troops would cross back home. DEBKAfile’s military sources report that the Turkish army has so far not gone further than exploratory steps in its campaign against the Kurdish YPG in Afrin. A major offensive with large numbers of foot soldiers and tanks has not taken place as yet. Erdogan appears to be pulling his punches to test whether the US will come to the aid of its Kurdish allies. But the question still open is: Will he go through with his threat to capture Kurdish lands spanning northern Syria from the Turkish border to the Syrian border with Iraq? If he does and succeeds in pulling off this ambitious campaign, Turkish troops will override the region declared just a few days ago as being under American military protection and secured by a new US-trained and armed Border Defense Force of 30,000 men. Will the 2,000 US military personnel deployed in the bases there then intervene? Russia has made its position clear by refraining from interfering with the Turkish air offensive although its forces control the skies over Afrin. Washington felt that the Kurds also deserved to be compensated for their Iraqi brothers’ loss of the Kirkuk oil city, which was seized last week by an Iraqi force boosted by pro-Iranian Shiite militias. US-backed Syrian Kurdish militias reported Sunday, Oct. 22, the capture of Syria’s biggest oil field of al-Omar in the eastern Deir Ez-Zour province. They were pressing on with their offensive against the Islamic State after capturing Raqqa. Al-Omar is located on the eastern bank of the Euphrates River. The Kurds’ takeover pre-empted its grab by a mixed force of Russian-backed Syrian army contingents and Hizballah, which had halted 6 km short of al-Omar. While in the hands of ISIS, this field pumped up to 10,000 barrels today and is capable of producing up to 40,000 bpd. If repaired and brought up to scratch, it could potentially yield up to 120,000 bpd. It now turns out that the Russian command’s secret order to the Syrian/Hizballah forces, exclusively reported by DEBKAfile last week, to halt where they stood after capturing Mayadin in eastern Syria from ISIS – and not advance on the oil field – was prompted by unpublished talks between US and Russian officers in the area. The officers reached a deal on the disposition of these oil fields. Under that deal, it was decided to award the Syrian Kurdish YPG militia the richest Syrian field as a prize for its role in leading the SDF in the capture of ISIS’ de facto capital of Raqqa. DEBKAfile’s sources add that Washington felt that the Kurds also deserved to be compensated for their Iraqi brothers’ loss of the Kirkuk oil city, which was seized last week by an Iraqi force boosted by pro-Iranian Shiite militias. The loss of Kirkuk to Baghdad and Tehran has deprived the Kurdish Regional Government of Iraq of the income from 600,000 barrels of oil a day. The al-Omar field produces a much smaller amount, but its revenue would save the KRG from economic meltdown. Sources in Damascus, disgruntled over the handover of al-Omar to the Kurds, accused the Syrian Arab tribes who fought in Raqqa of backing the Kurdish militia’s claim to the oil field. They also suggested that ISIS opted to surrender the oil field to the Sunni Kurds, rather than letting it fall into the hands of Assad’s Alawi regime. Russia’s consent to hand over Syria’s biggest oil field to pro-American Kurds was calculated to yield a quid pro quo in the form of Washington’s support for the Russian oil giant Rosneft taking control of the Kurdish oil pipeline from the KRG via Turkey to the Mediterranean. Last Thursday, the state-controlled Rosneft reported a deal with the KRG to take majority control of 60 percent in the operation of this pipeline project. The Iraqi government has demanded clarifications for Moscow’s step. Israel’s strategic situation took several steps back in the first week of the New Year, chiefly: The US pulled back from E. Syria under Russian threat, allowing Iran to move in. In just one week, the dire perils, which many military and political experts warned against for years, are suddenly looming on Israel’s northern border. From Sept.15-17, Syrian and Hizballah forces crossed the Euphrates to the eastern bank on pontoon bridges provided by Russia. Last Saturday, Sept. 16, Russian jets bombed the US-backed Syrian Defense Forces (SDF) in the Deir ez-Zour region, as a warning against their obstructing the eastward impetus of those Syrian and Hizballah units. On Monday, Sept. 18, US Marines began blowing up buildings at the Zaqaf military base in eastern Syria and then retreating to the Jordanian border. The US set up Zaqaf early this year in the Syrian Desert as a barrier against this very Syrian/Hizballah crossing to impede their advance to the Syrian-Iraqi border. The following day, on the heels of the US withdrawal, Hizballah troops took charge of the Zaqaf base. On Wednesday, Sept. 19, the Iraqi Hashd Al-Sha’abi (Popular Mobilization Units – PMU) crossed into Syria and linked up with the Syrian-Hizballah force. The PMU is under the direct command of Gen. Qassam Soleimani, head of Iranian military operations in Syria and Iraq. Iran, through its Iraqi, Lebanese and other foreign Shiite pawns, is now in control of 230km of the Syrian border, from Abu Kamal (still held by ISIS) in the north, to Al Tanf in the Syrian-Iraqi-Jordanian border triangle in the south – where, too, US and coalition special forces have begun packing up ready to exit. Iran in recent years imported some 20,000 Afghan and Pakistani Shiite fighters to reinforce the Syrian army and Hizballah in their battles for Bashar Assad. The new Iraq arrivals boost that figure by tens of thousands and more are coming in all the time. Where do these menacing steps leave Israel? The US has washed its hands of central and southeastern Syria. Russia is wholly, unreservedly and openly in lockstep with the Syrian army, Iran and Hizballah in all their objectives in the war-torn country, and moreover, willing to threaten any pro-American entity with total military punishment. Is this an indirect message to Israel too? Iraqi Shiite forces are surging into Syria; they have given Tehran the gift of control of a 230km segment of the border. Gen. Eisenkott underlined the IDF’s focus as being to prevent [Israel’s foes] from obtaining weaponry, i.e. missiles – of high targeting precision. The trouble is that, while the IDF focuses on this objective, commendable in itself, Russia and Iran are focusing and in full flight on a far wider-ranging goal, the precise and systematic deepening of Iran’s military presence in Syria. Iran and Hizballah have already established military commands at Arnaba just 6 km from Israel’s Golan border. Yet the IDF chief is still talking about this as an untoward event that may – or may not – come some time in the future. Russian air crews in Syria are under new orders to respond directly and immediately to Iranian and Syrian demands for air bombardments, without confirmation from the high commands in Latakia or Moscow. This has enormously empowered Syrian and Hizballah officers on the ground for taking the war into their own hands. It led directly to Russian planes suddenly bombing a pro-US Syrian force in the Deir ez-Zour province of eastern Syria on Saturday, Sept. 16, and accounts for Moscow’s repudiation of the attack after its confirmation by the Pentagon. Before the new orders, requests for Russian air cover went through command channels and were not automatically approved. The license now awarded to Syrian and pro-Iranian Hizballah commanders to contact the operations rooms of Russian air squadrons, without going through the main Russian air base at Hmeimim in Latakia or the Syrian high command in Damascus, dramatically boosts the autonomy of Syrian, Hizballah and Iranian commanders in the field. It also gives sharp teeth to Moscow’s decision in August to place the Russian and Syrian air defense commands under unified command. Word of this game-changer was delivered by Russian Defense Minister Sergei Shoigu, when he sat down with Syrian ruler Bashar Assad in Damascus last Thursday, Sept. 14. According to DEBKAfile’s sources, they decided the next Syrian army and Hizballah steps after crossing to the eastern bank of the Euphrates River, which were to head for the Syrian-Iraqi border and prepare to seize the towns of Abu Kamal and Mayedin from the Islamic State. The time table was established and Russian air, intelligence and logistic support laid on. The Russian defense minister then flew to Tehran – this time in secret – to discuss Russia’s new operation plans for Syria with Iran’s Revolutionary Guards and Military leaders. DEBKAfile’s military sources note that the actions set in train by Shoigu have radically ramped up Russia’s military cooperation in Syria with Iran, Syria and Hizballah. They were timed to take place shortly before President Donald Trump’s meeting with Israeli Prime Minister Binyamin Netanyahu at UN Center in New York on Monday, Sept. 19. Although their conversation was generally billed as focusing on the Iranian nuclear deal, our sources expect this major turn in the Syrian crisis to figure large in their talks. Washington clearly has no practical plans for countering the assertive Russian-Iranian advances in Syria. Their ruthlessness was demonstrated Saturday, Sept. 16, by a Russian bombardment of the US-backed Kurdish-led SDF near Deir ez-Zour. Moscow was telling Washington that the US would not be permitted to impede the Syrian-Hizballah initiative for the capture of areas east of the Euphrates and Russia was ready to confront US-backed forces on the ground if they got in the way – while ruling a clash in the air. The Kremlin was also putting Washington on notice that, after investing massive military and financial resources in Syria, it had no intention to let pro-American forces share in the kudos of the final victory over the Islamic State in Syria, which belonged solely to the Russian-Syrian-Iranian-Hizballah war alliance. For now, the Russian maneuver is heading for a successful outcome. The Pentagon, aside from a lame response to the Russian bombardment, has taken no counteraction. Our military sources point out that now, because ISIS is concentrating on battering the Syrian, Iranian and Hizballah forces and stalled their advance to the Euphrates Valley, the US-backed Syrian Democratic Forces, consisting mainly of Syrian Kurdish fighters from the YPG militia, have found that the road from Raqqa to Deir Ez-Zour is open and are overtaking the Russian-backed forces. The SDF is advancing rapidly with US helicopters providing them with fuel so their vehicles can press forward. Ahead may be decision to commit more Russian military forces to the war against ISIS or explore a path to a breakthrough in talks with the Americans. After a tense conversation with Bashar Assad in Damascus Tuesday, Sept. 12, DEBKAfile’s military and intelligence sources discovered the Russian Defense Minister Sergei Shoigu had flown secretly to Tehran the next day. He then proceeded directly to Sochi to brief President Vladimir Putin on his mission, which was to pull together the Russian-backed Syrian-Iranian-Hizballah operations against ISIS on the Syrian-Iraqi border. DEBKAfile’s sources report that Shoigu’s visits capped this effort by Moscow. The bright prospects of success in breaking the ISIS’ long siege of Deir ez-Zour announced at the beginning of the week dimmed on Tuesday and Wednesday, when the claims of a major victory proved unexpectedly premature. As of Wednesday evening, Syrian army units were still locked in battle for control of the main road from Damascus to Deir Ez-Zour, and were still about 15km away from the city. Reports that the ISIS siege on the large Syrian airbase adjoining Deir Ez-Zour had been lifted were also premature. On Wednesday night, ISIS forces were still attacking the base’s perimeter in an attempt to break through. In other words, the lofty claims in recent days by senior Russian officers, President Assad and Hizballah leader Hassan Nasrallah, claiming the war was won, aside from small scattered battles, were over-hasty. As of Wednesday evening, the SDF was just 6 km away from Deir Ez-Zour, ahead of the Russian-backed armies which were taking the brunt of ISIS attacks. When he saw this happening, Russian President Putin sent his defense minister over to Damascus and Tehran to look for ways to break through to the next operations scheduled for attacking ISIS strongholds on the Syrian-Iraqi border. Ahead may be decision to commit more Russian military forces to the war against ISIS or explore a path to a breakthrough in talks with the Americans..